Keeping up the feel of the name this dish is all of a yummy treat at our plates in just a few minutes. 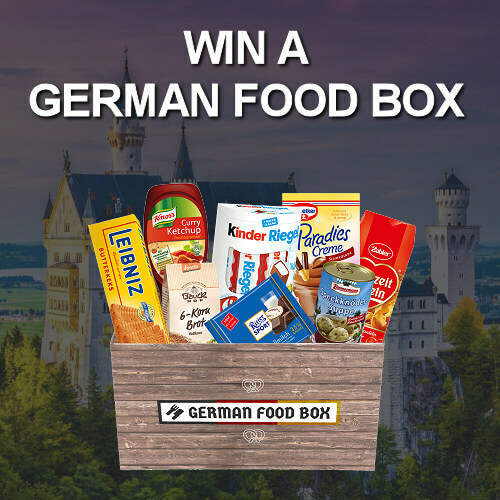 Depicting its existence straight from Germany this gives more of delicious flavor to our mouth and happiness all around. “Zwiebelkuchen,” in German, the word Zwiebel is nothing but onion, and kuchen is cake/tart. Likely bursting this thought or myth if there is a possibility of pie with onions, then Alas! There is. 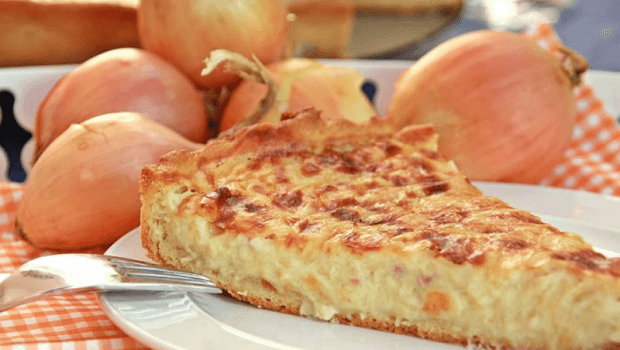 It is a round pie textured as well as like a pizza or as a tart with lots of steamed onions, cream, and caraway seeds on either yeast dough or a leavened dough and in addition to onions, the filling contains lots of meat, often ham or bacon. The golden brown texture on the outer layer with the caraway seeds gives more of the flawless feeling for hunger. Zwiebelkuchen always fell in confusion if it was a cake or a tart but ancient people always bought something which made all focus on taste than the confusion. But glancing the limelight more over the dish it is a onion cake,but it looks like a tart, thick savory pie. Onion tart is likely consumed much in the southern part of Germany at special festivals like wine festival. There is always a special ingredient as a new invention so one can use smoked speck, instead of bacon. And yes last but not the least if you likely like the onions, butter and bacon or meat,then YES! You will love the treat of having Zwiebelkuchen! Eggs and sour cream also are to be utilized in the filling, to give the tart a different creamy feel. Optional flavorings include nutmeg, marjoram or pepper. It is very easy to prepare, and this will bring the best aroma of hunger in your house. NOTE: Are you a vegetarian? You need not worry because you can enjoy this delicious treat by just through a simple change. All you have to do is replace the Diced Bacon or Meat with yummy Mushrooms or Cabbage. Moreover, there you have any amazing and delicious vegetarian tart. The following recipe is enough for 6 servings and can take as much as 1 hour 20 minutes of time. Before the preparation begins you will have to preheat the oven to 400 degrees Fahrenheit. We can begin with the procedure by preparing the dough. Now it is time to dissolve the yeast in the appropriately mentioned temperature of milk (Warm) and wait till clock ticks to 5 minutes. Take a large glass bowl and add the flour and salt and mix well. Take the butter quantity in a large bowl and pour the mixture of flour in it. Now it is time to knot the dough on bread setting (for about 6 minutes).Now take the wet dough and prepare balls out of the dough, ending it up with wrapping the balls loosely in plastic wrap, until the dough rises nearly double in size. In a frying pan, fry the bacon and then add the onions along with 2 tablespoons of butter until it turns crispy. This is fried at the lower flame for about 30-40 minutes. In a large bowl, mix full fat sour cream, all-purpose flour two tablespoons, two teaspoons salt, eggs, caraway seeds about one teaspoon, and fresh pepper will get more of flavor to this dish. Mix the onion and bacon mixture and mix thoroughly. If using refrigerated pie crust, Grease the pie crust and press the crust into the pan. If putting your efforts over the dough then, after the dough rises, it is time to butter up medium spring form and spreading the yeast dough on the bottom and the side you can proceed for pouring onion mixture immediately. Garnish the top by sprinkling a few caraway seeds, and it is now time for the uncooked dish to cook into the oven. Now the preheated to 400 degrees F, bakes the dish for 55 to 60 minutes, till the top of the batter turns to mesmerizing color golden brown. Moreover, once cooked let it cool before serving. Alas! The yummy treat is right in front of your plate. TIP – Tradition also highlights that Zwiebelkuchen can be best enjoyed with a glass of drink of Federweisser. Moreover, there you go with the amazing treat during your winters making your day more yummy and delicious one. Time to put on you apron on and get over to the kitchen. You can add this recipe to the menu of the family get together you are hosting or for a birthday party. Your guests will love it, we promise!